My main creative space is in my head, and believe me that can be messy. But it means that I can be creative wherever I am not compromised by my surroundings. With that said, having a physical creative space is on top of my list. Surrounding myself with things, memories and beauty that inspires me and fills me with joy. A place that is just for me, where I can find a moment to breathe and just be. 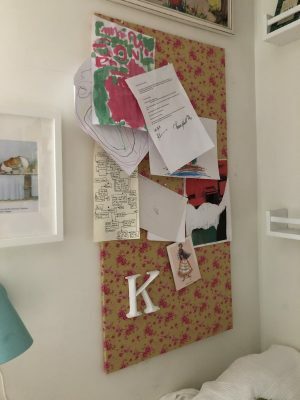 When me and my husband lived in a smaller apartment I solved it with large pin boards that I covered in beautiful fabric. I could switch them around and use the one I needed for the moment when I was working. Two of them I saved and used as pin boards in my previous studio. This is in my old studio, my former creative space, that I have now moved out of due to the fact that we are becoming a family of five. 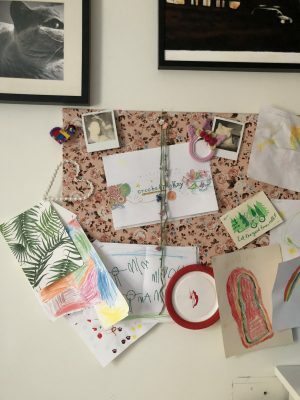 However, the pin boards are still up as it is now Minous room and she loves them. I’m pretty sure that they will have to stay there. I can always make more, and now it’s nice to make a fresh start! Another item that is probably staying in Minous room is this shelf unit below. It is not really a shelf it is actually a case divider for letters in printing. 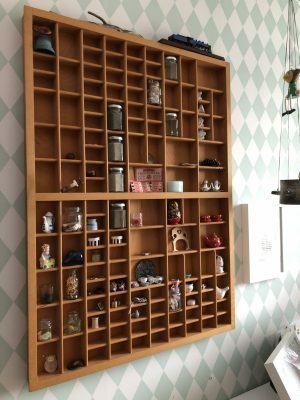 I love it and my husband gave it too me but taking either that or the pin boards down will create such big holes in the walls it’s just not worth it. This type of thing you can find at a good flea market or second hand shop. I’m hoping to find a smaller one or maybe even two! One thing that is NOT staying in Minous room is this my frame with yarn spools. It is one of my favourite things that I’ve ever made, with the help of my husband, that is not crocheted. I am way behind in all of my spool updating, but hopefully I will have some time when my new studio is complete! For me having a space to myself is important. That is why we are rebuilding our home to make sure that the kids all get their own rooms and that me and my husband can still work from home in our own creative spaces. The rebuild is pretty huge, we are moving the kitchen and creating rooms that we don’t have. We do love this though, every apartment we’ve lived in we have done up ourselves. There is something satisfying with driving a sledgehammer through a wall, if you haven’t tried it put it on your bucket list! Tess usually laughs at the fact that whenever she comes to our house there is something different. My husband is always building something and I’m always moving something. It’s true and I’ve been like that as long as I can remember. My mother would wake up in the middle of the night from a load of racket just to find me awake in my room having moved all of my furniture around. I guess I just need the change and I actually think that is a part of my creative process. Seeing things from different angles and perspectives. On the other end of the spectrum there are areas in our home that I don’t like changing around and I’m very strict about. For these places I really don’t like when things have been moved or not returned to their proper place. Different parts of the brain I think. I will be writing about creative spaces and I will let you come along on this journey of rebuilding. 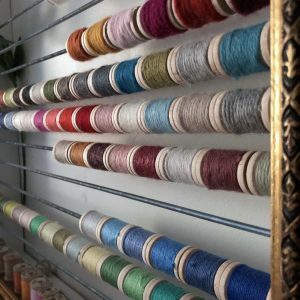 Or most importantly the making of my new studio, which is so exciting I’m finding it hard to bide my time until it all begins: My Creative Space – Part 2. So stay tuned, this is going to be fun!